Working on a geometry lesson? 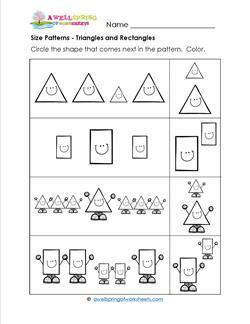 This size patterns worksheet might come in handy. 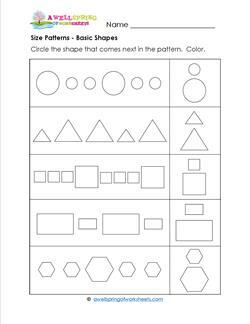 Circle the shape in each set that comes next in the pattern. Color. 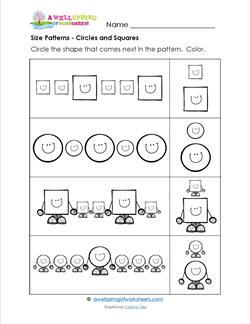 For this size patterns worksheet I've included happy shapes instead of just boring plain shapes. Circle the circles and squares that comes next in the patterns. Color. Cheer yourself and your kids up with the happy characters on this size patterns page. Circle the triangles and rectangles that comes next in the patterns. Color. 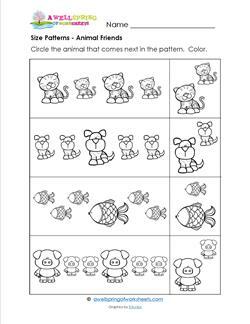 On this size patterns worksheet kids get to circle the cat, dog, fish, and pig that come next in the patterns. Look out! They might have too much fun with these fellas! 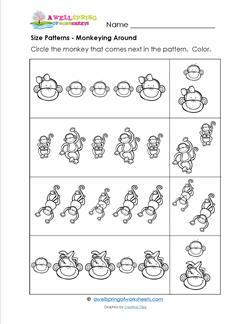 It's okay to monkey around while working on this size patterns worksheet! Kids circle the monkey face or swinging monkeys that come next. 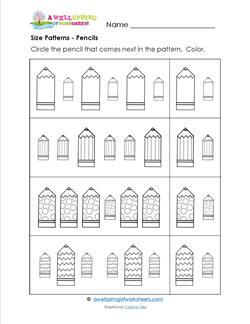 This size patterns worksheets has four different kinds of pencils. See if kids can describe them, after they circle the pencil that comes next in the pattern.